SBI Mutual Fund has launched of SBI ETF Quality, its first smart beta offering, an open-ended scheme tracking Nifty 200 Quality 30 index. The NFO opens for subscription on November 26 and closes on December 3. No entry load and exit load will be applicable for the scheme. The minimum subscription amount is ₹5,000 and in multiples of ₹1 thereafter. 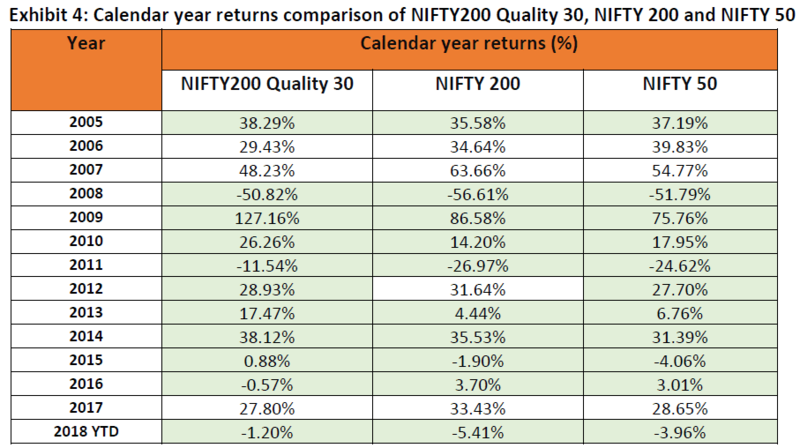 Stocks from NIFTY 200 index at the time of review are eligible for inclusion in the index. 30 companies with higher profitability, lower leverage and more stable earnings are selected to be part of the index. The weight of each stock in the index is based on the combination of stock’squality score and its free float market capitalization. For each eligible stock, Z score is calculated on the basis of return on equity (ROE), debt-to-equity (D/E) ratio and EPS growth variability in the previous 5 years. Debt-to-equity ratio is not considered for companies belonging to financial services sector. Latest fiscal year data is considered for the calculation of return on equity (ROE) and debt-to-equity (D/E) ratio. EPS growth variability in previous 5 financial years is calculated using adjusted EPS of previous 6 years. 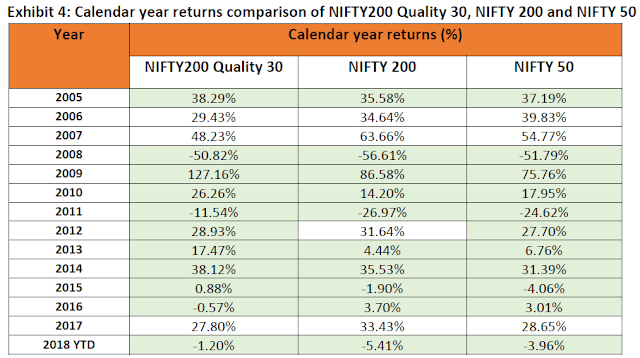 On calendar year basis, from 2005 to 2018, NIFTY200 Quality 30 portfolio has outperformed NIFTY 200 in 9 out of 14 calendar years and NIFTY 50 in 10 out of 14 calendar years. For anyone seeking beta offerings over plain index ETFs like Nifty 50 or Nifty Next 50, then one can consider investing this ETF.